This is not a bad programme, but there are several issues I would like resolved before I would shell out money for this. I don't know how this happened, but a NUL char was inserted into a file and put into source control. 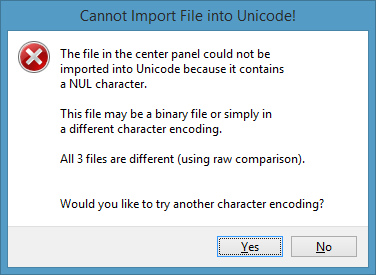 This effectively renders your product useless as it complains "Cannot Import File into Unicode!" I understand that this is kinda unexpected, but this way of handling it is unacceptable as no character encoding would resolve this issue. At the very least, a FORCE ANSI option should be made available. Your find utility in this is horrible. I press Ctrl-F and type in what I want to find. Then I get to a location I'm interested in and I have to use the mouse to be able to move around/edit from there! If I want to go to the next, I have to press Ctrl-F, Enter. Two keys? Further, if I want to go back, I have to use my mouse. If I want to toggle Match Case, mouse. And there is no regex find either. Switching between local, server and merge view is a pain requiring a mouse. Keyboard shortcuts are needed. Jumping between conflicts is ok, but if I take from server or local, the conflict is no longer in conflicts list, which I can sorta see why, but makes for a problem if I find something later on to make me realize that I dealt with a conflict inappropriately, requiring me to Ctrl-Z my way back up, instead of just going back to a conflict that I tried to resolve, and then reresolving those conflicts that I had just resolved. By pressing F8/Shift-F8 to next/previous conflict, I would expect the text caret to move as well, allowing me to use the arrow keys to move relative from there in any of the 3 windows. Don't get me wrong, there are many things that I do like about your product. However, aggravation vs cost ratio is too high at the moment. Thanks for your efforts. I hope these issues are resolved soon and I will suggest to the company I work for to purchase this great product. I'm checking with a developer on the file that ends in a null. We'll respond back on that part. 1) F3/ Shift-F3 should go to the next/previous item found even if you just edited. Once you click in the window once, you don't have to go back out of the window again for the search. I'll log a feature for selecting the window to edit and one for regex. 2 & 3) I can log a feature request for that. 4) Once you get into the window once, this isn't a problem. but DiffMerge does everything in Unicode and NUL chars aren't allowed. would probably help in your situation, but might be problematic for others. you can use Ctrl-G and Shift-Ctrl-G. I'll log a bug report to look into this further. had time to dig into this yet.